I don’t consider all systems of divination to be equal. More specifically, I don’t consider all that is considered to be divination to be actual divination. 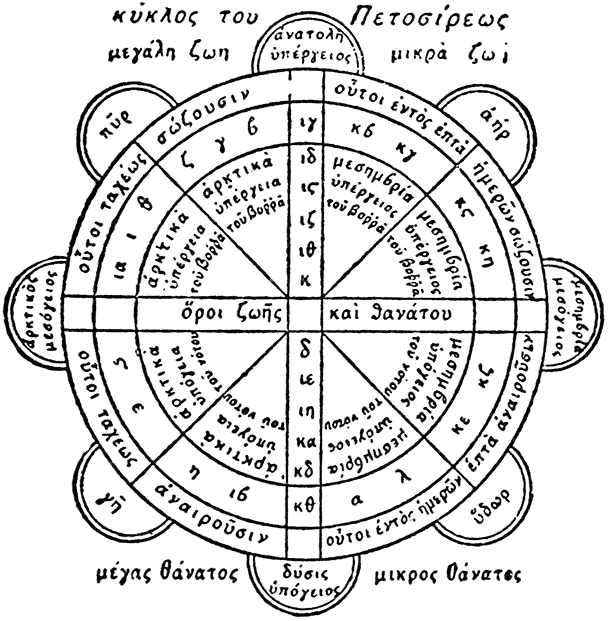 Geomancy, Tarot, augury, extispicy, horary astrology, and the like are divination systems to me: the interpretation of omens from physically random, spiritually determined sources by means of inspiration and technique. This is distinguished from prophecy or clairvoyance, which is sheer revelation of messages or sights from the gods, and it’s likewise distinguished from purely mechanical methods of prediction, such as economic and weather forecasts derived from mathematical formulae alone. All these things, however, share something in common: revelations about the future. As a diviner, I find this an extraordinarily useful field of magic and occultism, and one of the things I insist those who are interested in magical practices to investigate first. However, I don’t rank numerology among useful methods of divination or prediction. I never have, and I doubt I’ll ever ascribe it the same level of predictive power or flexibility as, say, geomancy, and I put numerological methods of divination in the same category as phrenology, palm reading, and other forms of physiognomy. Something about the use of fixed factors in divination irks me, especially when it comes to matters of names, number, and the body. Then again, I consider my natal horoscope in astrology to provide useful information, and I do consider haruspicy to be worthwhile; I suppose some fixed factors can be used in divination, if applied judiciously enough. Moreover, even if I don’t consider such methods to be the most reliable or trustworthy, I’d appear to be in the minority with that view, considering how much of the old literature dating back to Hellenistic times is devoted to these topics. One of the most well-known and well-used forms of numerological divination involved the isopsephia, or Greek gematria, of a person’s name in determining their health or lack thereof. 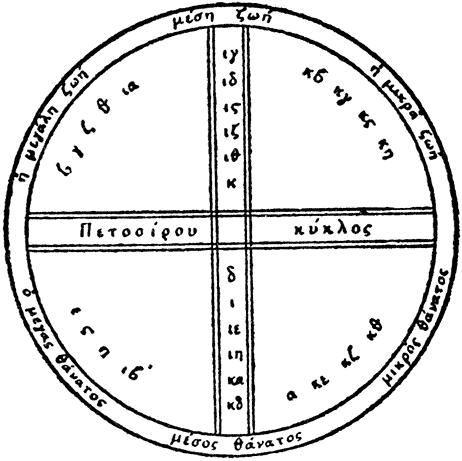 Divination was heavily used as a prognostic tool in medicine up even through the Renaissance and early modern times, sometimes through pre-modern medical means like uromancy, sometimes through astrology, and sometimes through numerology. One such method of numerological divination using names, sometimes called “onomancy”, involves determining whether a patient will live or die from their illness based on their name and the date on which they fell ill. 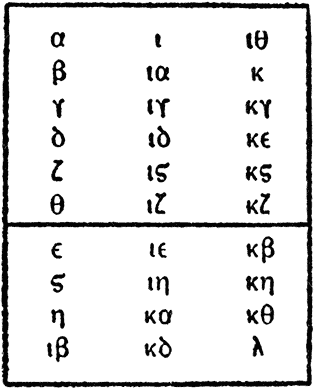 Although my resources are scant, mostly coming from some Gutenberg texts and the PGM, let me describe two (or three) ways Greek name divination was used with isopsephy to determine how a given matter would turn out. When we say “the day on which the person fell ill”, we mean the lunar date starting with the Noumenia. Thus, if someone fell ill three days after the Noumenia, then the day number of the lunar month would be 4. If someone fell ill on the last day of the month, i.e. the New Moon, then you’d need to check whether that month had 29 or 30 days. We note the day that someone fell ill based on when they took to rest; for us modern people, that might be the first morning we just couldn’t get out of bed to go to work or class if we were feeling okay the night before, or the very day we suddenly fell nauseated and went home to rest from the office or school. Obviously, given the advance of modern medicine, people don’t tend to get sick as severely or as fatally as they used to (but who knows, that’ll probably change given the end of useful antibiotics and the rise of superbacteria looming over us). While it’s possible someone could always die from an illness (gotta love human mortality! ), consider the more dire warnings given by these divination methods to be something indicating a chronic, debilitating, or acute disease, while the more mild warnings something comparably mild to endure. In mathematical notation, the percent sign (%) used as an operator indicates the “modulo” operation. While the division mark (÷) indicates division, the modulo mark indicates the remainder. So, 28 ÷ 9 = 3.333… or 3 with 1 as a remainder, while 28 % 9 = 1. The first is the Sphere of Democritus, a prognostic technique from PGM XII.351. This technique determines whether a sick person will live or die based on their name and the calendar date that they fell sick. First, calculate the isopsephic value of the person’s name and add to it the day of the lunar month on which they fell sick, took to bed, or called out of work. Once this sum has been found, divide this sum by 30 and take the remainder. The text gives a rectangular chart divided into two parts; if the remainder is in the upper part, the person will live, but if in the lower part, the person will die. They will live if the remainder is 1, 2, 3, 4, 7, 9, 10, 11, 13, 14, 16, 17, 19, 20, 23, 25, 26, or 27. They will die if the remainder is 5, 6, 8, 12, 15, 18, 21, 24, 22, 28, 29, or 30. So, let’s say it’s 200 AD, and my name is actually polyphanes (Πολυφανης), and it’s a few days before the full moon, say the 12th of the lunar month. I suddenly get a fever and I decide to go to bed, and a healer-magician comes by and runs some tests. The isopsephy of my name is 1339, and added to the day number 12, this yields 1351. 1351 % 30 = 1, and we find 1 in the upper portion of the Sphere. Good news! I’ll be fine. Let’s say that, once more, I’m sick and instead of calling over the healer-magician from before, I call over a different magician who uses the Circle of Petosiris instead of the Sphere of Democritus. Again, the isopsephy of my name is 1339, and added to the day number 12, this yields 1351. 1351 % 29 = 17, and we find 17 in the “average life” section of the Circle. Good news! I’ll live reasonably well once I recover without too much a threat of relapse. Another method can be used in this Circle such that one takes the isopsephic remainder of the person’s name divided by 30 and compared against the day number of the lunar month on which they fell ill. These are then both compared against each other. If both numbers are in Brightness, the combination promises a good figure; if both in Darkness, an unfortunate one. If the day number of the lunar month is Bright and the number of the person Dark, then misfortune will occur under the pretense of fortune; if the number of the person is Bright and the day number of the month is Dark, the person will do well eventually though they’ll be in danger. This method is extended more generally such that if one number or the other or both are above the horizon or below, we can get similar answers, though the Bright and Dark numbers themselves appear to be middling between “great life/death” and “small life/death”. Once more, I’m sick and instead of calling over the healer-magician from before, I call over a different healer who’s much fancier in his techniques and who uses the this second Circle of Petosiris instead of the other methods. Again, the isopsephy of my name is 1339, and added to the day number 12, this yields 1351. 1351 % 30 = 1, and we find 1 in the “small death” section, where I might die within seven days due to the illness. However, if we compare the numbers of my name and the number of the lunar date, then we compare 1339 % 30 = 19 against 12; 19 is Bright (above the horizon) and 12 is Dark (below the horizon). All told, this will be reasonably chancey for me, but I should be able to live and get through this with enough help, though I’ll be in danger of dying all the same.